Samsung took no chances with the design of the Galaxy Note 8.0, sticking to the styling of the Galaxy S III and Galaxy Note II. The finish of the portable slate is very similar to that of the company's flagship smartphone, too. Now, that may not sound too bad at first, but the design is really starting to wear off at this point, so we really wish Samsung went in a different direction this time. Rather peculiarly, just like the Galaxy S III and the Note II, the Galaxy Note 8.0 tablet supports native phone calls (or at least as far as the 3G/4G version is concerned). It features a micro-SIM compartment as well as a microSD card slot. At 338 grams, the Note 8.0 feels reasonably light in hand, but it's still a bit heavier than the iPad Mini. Whether or not the extra heft is worth it depends on your need for an S Pen and the Wacom digitizer that comes with it. Mentioning the Samsung Galaxy Note 8.0's display, we have to admit we hoped to see a Super AMOLED panel, so the regular TFT PLS unit left us a bit disappointed. It still gets the job done, but with its only average contrast and unspectacular ppi, it's not what you would call a premium screen. And Samsung reps at the booth would really go out of their way to convince us that the Galaxy Note 8.0 is, in fact, a premium device. Android 4.1.2 is in the driver's seat, which of course means the Note 8.0 benefits from Project Butter. The latest version of the TouchWiz UI, known as Nature UX, is also in tow and comes with the latest bells and whistles. One of them is a cool settings feature to fine-tune the screen brightness in auto brightness mode, by defining an offset (+/-1, +/-2 etc, which mean the Note 8.0 will always select a brightness setting higher/lower than it feels appropriate). There's a special reading mode too, which automatically adjusts the display for reading. The feature is only supported by a handful of apps so far, but the good news is the default ebook reader is among them. The end result should be a better experience for those long reads you do on your tablet. Sounds nice on paper, but we will need to spend more time with the Note 8.0 to be convinced of the actual worth of this feature. As this is TouchWiz on Jeally Bean, we also found some of the usual Samsung-exclusive features like Smart Stay, Multi-Window mode for enhanced mutli-tasking, Air View functionality as well as Popup Play mode. AllShare Play and Cast are also present. We found the S Pen to be as useful as ever and is irreplaceable for selecting, highlighting and editing text and images. It's also capable of performing the same tricks as on the Note 10.1 when you press the button found on its side. By the way, there's also an IR blaster waiting for you to aim it at a TV and start using it as an 8" remote control. This isn't the most exciting of concepts, but the nicely designed app was keen to prove us wrong. Sadly, we couldn't take the 5MP camera for a spin and see if it's any good, but we'll try to fix that in the coming days. Inside the tablet sits a 4.600mAh battery (non-removable, of course). Don't expect it to last a lifetime, but it's not too shabby for a device of this size. 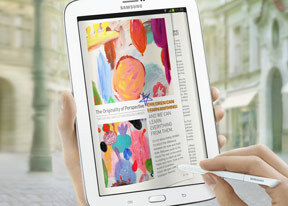 Hold on tight onto the next page, where you'll find our hands-on video detailing the features of the Galaxy Note 8.0.